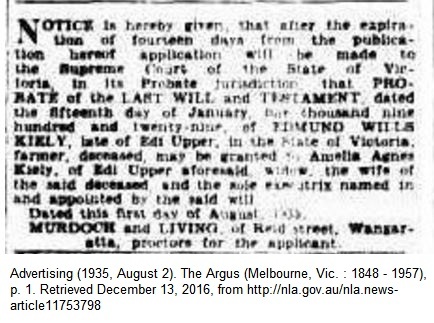 My Mum’s paternal grand-aunt Amelia Agnes “Millie” HART married Edmund Wills (or Wells) KIELY in Victoria in 1901. Millie was born in 1879 at Echuca, the sister of my Mum’s grandmother, Margaret HART. They were daughters of Peter HART, originally from Huntingdonshire, England, and Agnes MASON. Millie and Edmund KIELY had 7 children all born in the Wangaratta region, Victoria where they farmed for many years. 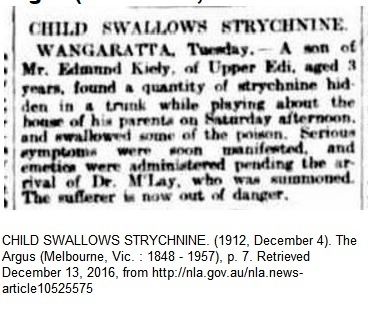 One of the boys in 1912 swallowed strychnine and luckily survived. Edmund Kiely died in 1935. Millie KIELY nee HART died in 1971 at the grand age of 92 years. Longevity seems to run in the family as Mum’s grandmother also lived to her 90s as did many of the HART sisters. Thank you for this information. I have just been given a photograph of Edmund & Amelia’s wedding (my great grandparents) and was trying to find when it was taken. Your information has been a great help.